It’s been a while since I last wrote a blog entry. Life has been so very hectic, as many of you can relate to, I am sure. 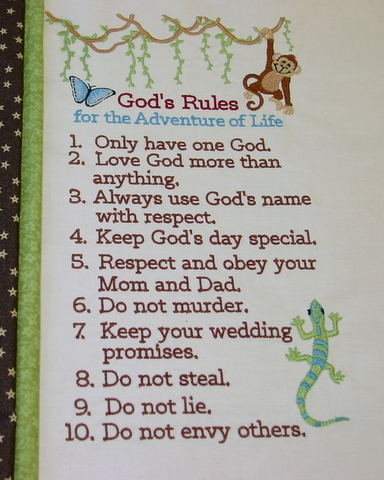 It has been weighing heavily on my heart lately that so many of the children today will not know the 10 commandments and I have felt a sense of urgency to put out an embroidery design that would help children remember what those God given commandments are. I had just fnished stitching out the design, when Saarah came and sat on my lap. She admired the design and wanted to know what it was. 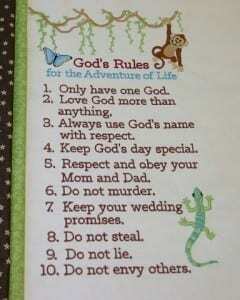 I explained to her that these were the rules God had given to mankind to live by. She immediately said “Then I need one of those wallhangings in my room, too, Grandma. I want to know what God expects from me.” What wisdom from a 7 yr old. And, yes, I plan on making wallhangings for each child – matching their room theme. We then went over each commandment and she asked questions as we went along. What a great teaching moment. I love the fact that our grandchildren live close to us and that we get to interact on so many levels. I haven’t written much about Siddiq anymore. He is doing well, except for the great loneliness that so many Aspie children and adults experience. They know that they are different and so desperately would love to “fit in” – or at least know that they are accepted and appreciated for who they are. We as a family, of course, do that but it’s hard to find peers that do. There is a poem on “Autism Speaks” that was written by a 9 yr old boy with Asperger’s. It could have been written by Siddiq. He has expressed all of those feelings at one point or another. If you get a chance, please go and read it. It will help you gain a deep understanding of these children. It brought tears to this grandma’s eyes. Thanks for visiting Oma’s Place. I promise I will try to write more often.